I was to meet some friends for lunch on one of my friend’s birthday. I was the first one to arrive. There is a little store, Moonfyre Metaphysical, between the two restaurants we were deciding between. While I was waiting I popped in to see what stones they have. It is one of those stores that has stones, crystals, candles, incense, books, CD’s and stuff. They have a wide range of books. They also do readings and Reiki. I was primarily looking at the stones. One caught my attention — Mookaite (aka Australian Jasper). My friend walked over to where I was and immediately reached for one and was about to say something when she saw that I had already noticed how pretty they were and was reading about it. It is a combination of jaspers; red and yellow. 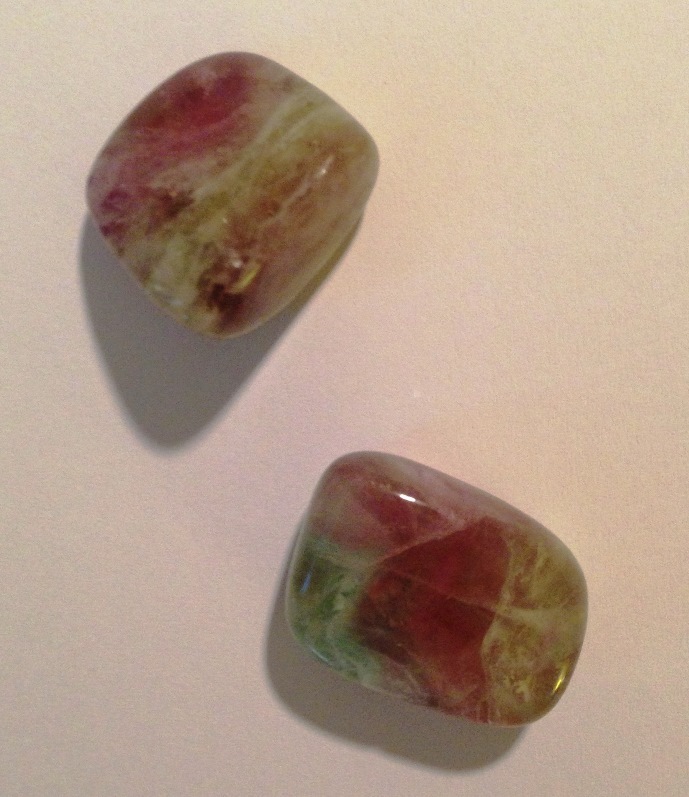 Some of the stones were primary red, some primarily yellow, and some a nice mix. I chose two. One with a multitude of striations. They are so pretty. Normally I am attracted to blue. So I always gravitate toward blue stones and crystals, but this time I was fascinated by a RED (and yellow) stone. Which is really funny because I normally don’t care for either. But these were really beautiful. In the container in which the stone were held there was a little piece of paper describing the stones. I asked the clerk if I could have one of the papers if I bought the stone and he said that I could have it no matter what. They are printed for people to take. So I was happy. Mookaite is a unique combination of red and yellow jaspers from Australia. It imparts both a desire for new experiences and a deep calm with which to face them. Flexible mookaite encourages versatility. It points out all possibilities and assists in choosing the right one. 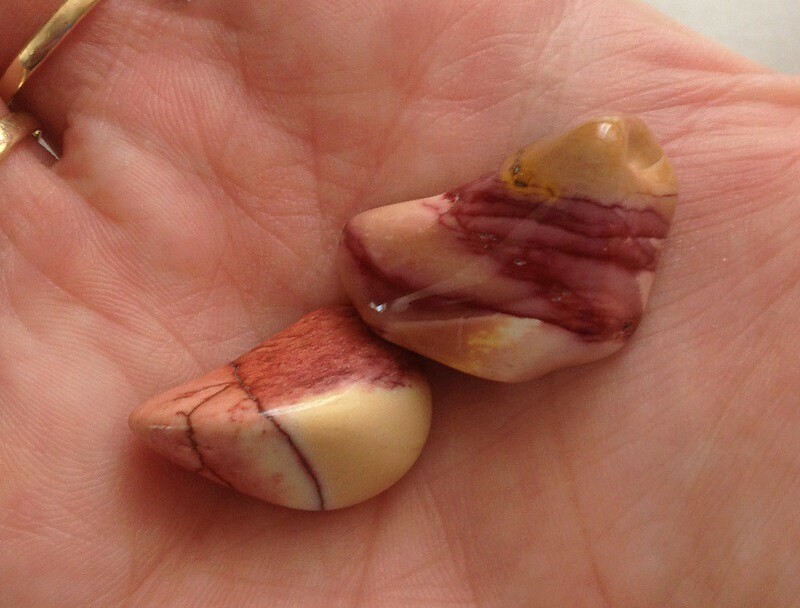 Mookaite is a physically stabilizing stone that fortifies the immune system, heals wounds, and purifies blood. Ha. When I read that I figured I needed this stone and that is why I was attracted to it. At this time I am not sure about the “desire” for new experiences, but I am certain I am having new experiences. I am having to face situations with an extremely ill pet and so I focused on the “deep calm with which to face them”. It has been my experience that with medical situations you have to be versatile because diagnoses change along with treatments as things progress. I need to see all possibilities and need assistance in choosing the right one. While my beliefs actually are in God, I do believe that He has created tools for us that can help us along the way. So it is not outside of my scope to think that a stone might actually encourage some of these things. Even if it is just in the form of reminding me to pray and trust. As I was typing this up I thought if it really is a stabilizing stone that fortified the immune system, heals wounds, and purifies blood, I should make a collar that will hold it and have my cat wear it. Oh, yeah, she would love that. Information on a website regarding Mookaite made me laugh because it is so fitting. It said this stone helps when working with animals. Also it helps make you more aware of natural cycles and see life patterns. Trippy, huh? I walk into a store and pick up a stone that is thought to help with facing decisions and allows you to be aware of the circle of life. I always wonder where the information comes from about what properties the stones and crystals have. Maybe that is another blog post. Anyway . . . I was pretty convinced I was suppose to find it when I read the little paper, but the information on the website has me really amazed and even more certain. Where do you stand in the belief about stones providing assistance? I’ve written a few posts having to do a bit with chakras. I’m still not all that familiar with chakras. I believe them to be energy points in the body. Points from which energy flows, both into/out of, to/from. I read a site that said “the area of interconnection between the body and the spirit”. I find that to be an interesting idea. There is a lot of information out there about chakras —- a lot of information! Not all of it matches up or is in agreement so I tend to look at a bunch of information and different sources and go with what I see the majority of and disregard the rest if I can’t find another source to corroborate the information. Some information claims there are seven chakras, other information claims there are more. I can see there maybe being more, but I am just focusing on learning about just seven since there is so much information out there. Most information is in agreement with a few facets of chakras. Most agree that there is a color associated with each chakra. Most information agrees that there are other things associated with each chakra; a sound, a tone, a stone, and a symbol. Some say a flower and/or a plant. Most even agree with the idea that the chakras are associated with parts of the body and/or functions of the body. But even though the information might all concur that there are all of these things associated with specific chakras, the information does not always agree with the details of the association. I’ve seen that there is usually one color associated with a chakra. But I have seen that there are many gemstones associated with each chakra. Sometimes the gemstone will be the same as the color, but sometimes not. It could be that the stone is associated with the chakra but the different color is thought to do different things. I posted about my pendant I purchased that is made up of the different chakra healing stones. Those are not the only stones associated with the chakras. A chakra is thought to be balanced or unbalanced. An unbalanced chakra could be either open or closed. With an unbalanced chakra the energy does not flow properly. The energy being out of whack could cause physical ailments, symptoms, or actions. In my post about the heart chakra I touched upon information that the heart chakra is associated with “the heart, the circulatory system, the entire chest area, lungs, breasts, the diaphragm, the thymus gland, the immune system, and some say the endocrine system.” The chakras are often associated with feelings and emotions. When I wrote that post I was sensing my lungs, they seemed to tickle and itch. 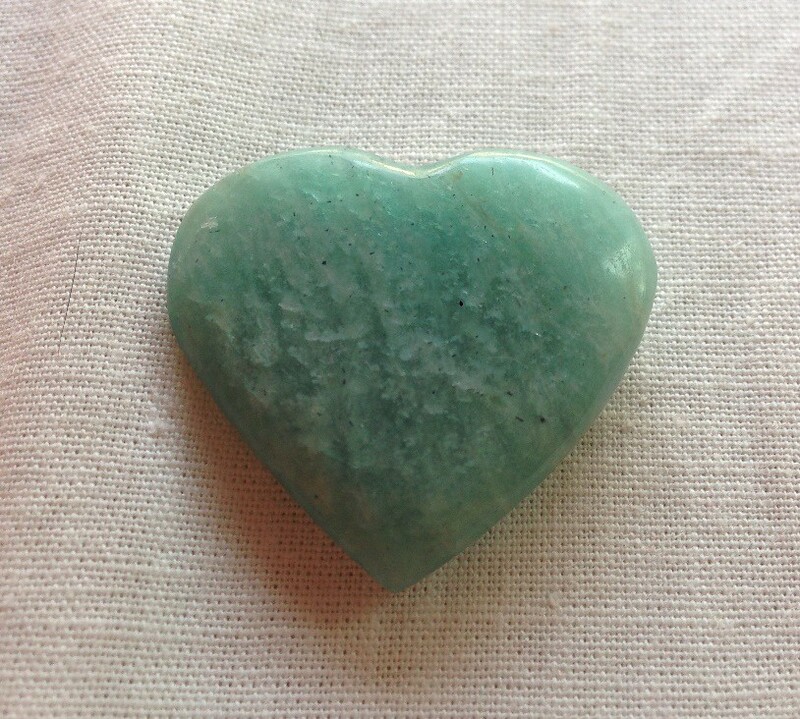 I believe since the heart chakra is affected by grief my lungs were being affected because that was shortly after my mother-in-law died. It is even more significant that the heart chakra is located behind the sternum. I think it is interesting to entertain the idea that there are chakras and these energy points are associated with body parts and body functions. And if you have an unbalance in a specific chakra you could have physical issues. As I was saying for me, I believe grief equaled itchy/cough lungs. One of the challenges with chakras is, as I said, there is a lot of information out there and sometimes there is such a large association it is difficult to even really believe that it is the chakra that is unbalanced and that is why there is an issue. Sometimes the list of things a chakra is associated with is just too lengthy to comprehend or the information contradicts itself. Never the less I think it is interesting and for me it is something I think about when I am having a physical symptom. I think is this a chakra imbalance manifesting itself as a physical issue. While I don’t think chakra balancing is a substitute for medical attention when needed, sometimes it is still nice to know. With all these thoughts about chakras it reminds me that I love to use chakras as the focus in my Nia classes. I think I will us one as the focus in my next Nia class! How do you feel about the whole chakra thing? Are you a believer? Do you know much about them? Recently I have become curious about healing stones. I am wanting to learn more about Chakras and in doing some research about them I came across information about colors and gemstones that heal. It is all very interesting to me. I am at the point where I believe that everything holds energy. But how or if that energy transfers over from stones and has the power to heal, I am still iffey on that. I have come up with ideas and reason where I can comfortably accept that this is possible so, I figured why not get some pretty jewelry to boot. Here is my first piece of chakra jewelry. I have been told that silver has strong healing properties, but I just don’t wear silver, so in my search to find something that I would wear that was under $70.00, I found this. I thought it was gorgeous, so when I saw that it was under $30.00 I figured that I was meant to have it. I had been looking for weeks, so I was so excited to find this. When I received it, I was not disappointed. ROOT CHAKRA: Poppy Jasper for healing, grounding, and completion. I believe it is actually “gold plated” wire, but it is awesome. I will continue to research this information and post as I learn and go along.